"A prize of £20,000 to any man who finds a practicable and useful solution to longitude at sea." 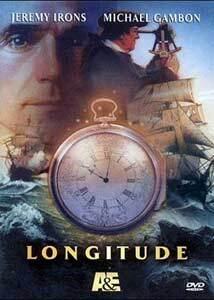 Longitude is the story about what some might think a boring subject, finding time at sea. Up until a few centuries ago man was able to find latitude easily (by celestial observation), but was unable to tell longitude, which is based on time (time on ship versus time at the port of departure). The story traces two men centuries apart: John Harrison (Gambon), an 18th Century Yorkshire carpenter who is eerily able to create timepieces of wood that keep very accurate time, and Naval Officer Rupert Gould who follows Harrison's footsteps two centuries later. In 1707, Admiral Shovell lost the 2,000 men in his Armada off the isles of Scilly (he thought he was near Brittany, 90 miles from where he actually was), as they were dashed upon the shore. Because of this, Parliament, upon the order of Queen Anne, created a £20,000 reward for any man able to create a practicable and useful way of determining longitude at sea. The Longitude Board, made up of astronomers, and its beauracracy was similar in many ways to The Royal Society, who Jonathon Swift had significant disdain for (see book III of Gulliver's Travels, taking place on the island of Laputa), preferred a celestial-based astrological resolution over a mechanical one—particularly over those created by a simple carpenter who was not a scholar. Harrison faced more than the laws of nature, and the lack of reliable scientific information or access to it, but near 50 years of skepticism, backstabbing and infighting among the factions of the Longitude Board. To the former, Harrison discovered that his first model (H1) was too large, and susceptibility to centrifugal movement caused it to lose time over the long courses of time due to the turns a ship makes at sea during a long voyage. Rupert Gould is a captain in Her Majesty's Royal Navy, who too shares with Harrison a love for clocks and time. After he suffers a breakdown during WWI, he goes on to live a normal life with wife and children. Just prior to WWII he decides to hunt down Harrison's sea clocks (H1-H4), after taking a trip to see the original Yorkshire wooden clock, named the Grasshopper, because its timing mechanism resembles the leg of the insect. While Gould successfully restores the machines, the life around him is destroyed, and he loses everything because of his single-mindedness. The parallel stories of the two men two hundred years apart is what helps push this film beyond a simple reenactment or docudrama. It is the near possession of the latter man that almost single-handedly restored Harrison's horological triumphs to posterity. All of the acting is superb (including walk on roles by Ian Hart, Stephen Fry and Nigel Davenport), but both Gambon (who played the Singing Detective in my favorite mini-series of the same name) and Jeremy Irons are exquisite in their roles as men tormented by time, and who share a unique vision and passion most ordinary men can barely comprehend. For me, a guy who is during the day a project manager (well until next Monday! ), the concept, design, development, testing, retesting and heading back to the drawing board is all too familiar. When one sees a film such as this or Apollo 13 or From the Earth to the Moon, one cannot help but be in awe of Man's capabilities. It is in the creation and successful implementation of such vision that one is able to see the power of thought and education. Have faith in yourself, and with commitment and persistence you may discover a new world never achieved before. The possibility that each man holds in his brain is far greater than lightening in a bottle, it is our link to perfection, to the universe. Image Transfer Review: Reportedly this series played in the UK in a 1.78:1 aspect ratio, and not the 1.33:1 aspect ratio presented on this disc. Disheartening as this is, add to that the fact that this is an average, and typical A&E image transfer. Obviously, this was created on film and transferred to video, from which they most likely transferred this image. There is an overall dullness to the image, as if a haze hung over the entire project. Scan lines are very evident, which adds to this "milky" quality. I'm sure that on a 16:9 HDTV at least the scan lines could be reconciled, but I don't imagine it will help the quality much more than this. I found little in the way of dirt, shimmering or aliasing. Not a bad transfer, just average. Audio Transfer Review: This is a decent Dolby stereo mix decoded as Surround 2.0, which is mostly center channel programmed. The heavy emphasis on dialogue makes this a good choice, and despite many a thick accent it is understandable without the subtitles more often than not. The sound of sailing on the open sea, the firing of guns and the nice, underemphasized musical score are rendered nicely across a generous front soundstage that surprised me. Some of the musical score slipped into the rear speakers like a lovely little bonus. Extras Review: Not too much going on here, although the English subtitles were a major plus (very bright white, easily readable). The 22m:33s behind-the-scenes documentary (which I'm sure aired as a promotion for the mini-series on A&E) is very nicely done, but should NOT be watched prior to viewing, unless you're one of those weirdoes that reads the last page of the book first. I wonder if there aren't any nice documentaries that might have been purchased for inclusion? I would have stayed up all night eating this stuff up had there been more extras, but I won't let the minimum amount temper my recommendation. This really was a throwaway viewing for me at 11pm on Saturday, but I was so riveted that I soon discovered I could not stop watching straight through until 2:30am (with extras). There is something about an A&E presentation: you just know you are being robbed of facts, but that the costumes and language are fairly authentic. I really cannot recommend this more highly; this is one of the best films I've seen ALL YEAR. Somewhere Swift is smiling.